Alpha Dairies was located at 57 Cannifton Road in Belleville, Ontario. Donated by Jim Brown, via Richard Hughes. 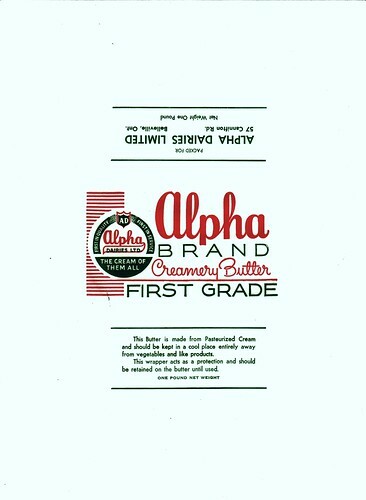 Three sheets of paper used for wrapping pound weights of 'Alpha brand Creamery Butter, First Grade' produced by Alpha Dairies Limited of 57 Cannifton Road, Belleville, Ontario. The dairies are listed at this address in the 1949 Vernon's directory of Belleville.